The last time I was able to attend the Houston International Quilt Show was in 2004. Another forum member, DoroTeddy, was also going to be there, so we signed up for a class together. Fortunately, the sewing machine were provided (! ), so all we needed to bring was the fabrics from the supply list and our own sewing supplies. Since we knew what the class project looked like, we were able to audition color choices for the layout using Electric quilt. Doro & I emailed each other furiously before meeting each other in Houston so that she could see her fabric choices in EQ also. Let us now fast-forward to 2008 (yes, 4 years later). I have accumulated quite a pile of UFOs and have been feeling somewhat anxious about that pile. I have a LOT of quilts I want to make ... and even have the fabric for them ... but what good is making the top if it never gets quilted? And I really do have too many tops to feasibly send them out for quilting. So, I firmly tamped down my desire to start another new project (that New Project Happy is quite a forceful draw!) and began in earnest to whittle the UFO pile. I became better acquainted with Tin Lizzie (my longarm quilting machine) after a long hiatus and this top became the 4th one to be (mostly) quilted with Lizzie. designs that look simple may not be. it's OK to not quilt the entire top with Lizzie. This quilt has a nice plain fabric border around the outer perimeter. *Perfect* for a nice swag design. I even had an adjustable template that allowed me to mark the proper swags for the size of the border. The inner, narrow border seemed appropriate for a cable design. And I wasn't sure what I wanted in the complex 9-patch center medallion. I didn't dare try to do anything to the center medallion 9-patch. When I returned to Lizzie, I spent quite a bit of Quality Time with Jack (the ripper) and removed every, single, doggoned stitch from the dismal swag and equally dismal cable. As I studied the quilt, I realized that I really DID like the swag design and wanted to keep it. 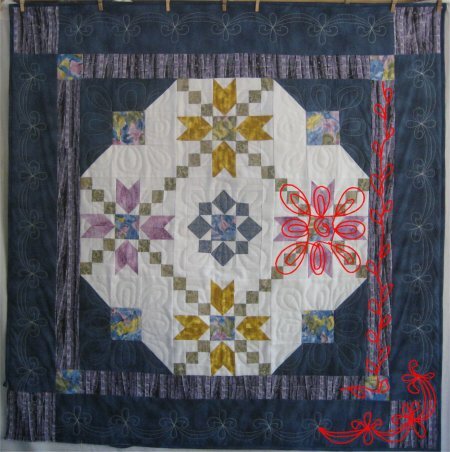 My good buddy, Ami Krenzel (SewingUpAStorm on About.com's Quilting Forum) mentioned that even Sharon Schambers has said that she will use her home machine for quilting stuff on the same top that she has done longarm designs on. That really made me feel a whole lot better cuz I knew that I could do a credible job on the swags with my home machine. The cables, however, needed to be replaced. Yes, I could have done the cables on my home machine also, but the entire point of these quilts is to get me practice on Lizzie before I attempt the bigger quilts! So, I substituted a leaf-on-a-vine motif that I've used before. It turned out "reasonable" ... not as nice as I've done on my home machine, but I keep reminding myself that this is a *different* skill set and what I can do nicely on my home machine isn't necessarily translatable to Lizzie. The center medallion is a 9-patch of 2 complex blocks. I know that stitch-in-the-ditch needs to be done with a straight-edge template .. and I actually have one! Yet, the center medallion blocks didn't have all the same fabric, which meant that, on some blocks, the stitch-in-the-ditch was going to be a contrasting thread. My ruler work isn't THAT good, even for just straight lines ... so no stitch-in-the-ditch. After pondering a while, I devised two concentric ovals for each of the blocks in the 9-patches. It seemed to complement the hard, angular geometric lines. I did these free motion and while they aren't "perfect/perfect" .. because I wasn't using templates ... they aren't half-bad either. In the end, I am not-displeased with lthe effectl. The binding got made and sewn on ... I even got the label made! I like to enclose 2 sides of the label with the binding .. it just makes it a little bit more difficult and annoying if anyone wanted to remove the label for any reason. So, this top is now a quilt and I can cross it off my UFO list (which is now down to 47 items, which does NOT include the tops I made subsequent to creating the UFO list [sigh]). In late summer of 2012, there were some truly horrific wild fires across the western states. One of my quilting buddies was only 30 miles away from the wildfire in Washington state. Many, many homes were utterly destroyed, although, thankfully, no lives were lost. Still, I can't imagine the devastation of losing not only the contents of your home but the building itself. My friend is one of the coordinators to make comfort quilts for the families involved. She has asked for 12" (finished) quilt blocks, either orphans that one might have laying about or a specific house block for which the pattern was provided. While I didn't make any blocks for the effort, I did dig around my quilt stash and came up with 8 quilts that I had made over the years but wasn't particularly emotionally attached to. These weren't shoddy quilts .. they had been carefully made, quilted and bound ... but they might have been experiments or a class or turned out to be a size that wasn't terribly useful *to me*. But they all were perfectly good, useable quilts, especially for kids. This quilt, Houston 2004 class quilt, is one of the quilts that I sent to help with the Taylor Bridge fire effort.